Lowry Air Force Base, on the east side of Denver, Colorado, started in 1937 as a training base for the Army Air Corps. The base was named for 2Lt Francis Brown Lowry, a Denver native and an aerial observer in the 91st Observation Squadron in WWI who was killed by German anti-aircraft fire. He is remembered in the collection at the Vintage Aero Flying Museum. Lowry AFB continued to train US and international air force personnel, mainly in aerial photography, bombing, missile, and gunnery skills, until it closed in 1994. After the United States Air Force became a separate service in 1947, Lowry AFB was the temporary location of the Air Force Academy before it moved to Colorado Springs in 1958. Since the base was so close to downtown Denver, and there was an active runway at the nearby Buckley AFB, flights from Lowry stopped in 1966. 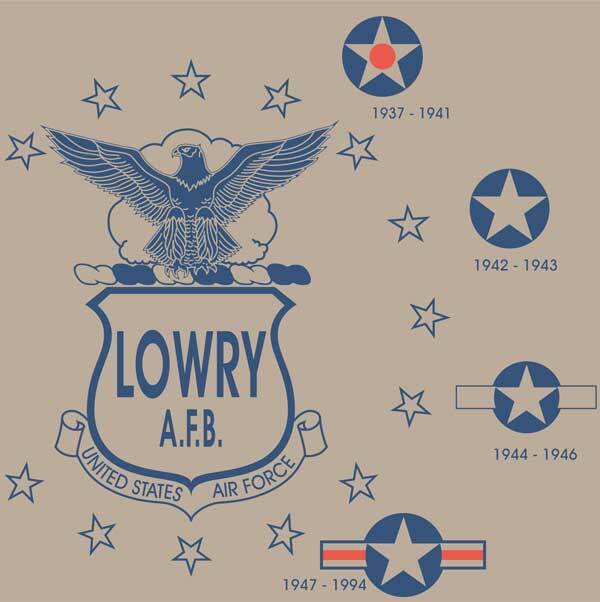 This shirt was designed to commemorate Lowry AFB for the Wings Over the Rockies Air and Space Museum gift shop, which is in Lowry’s old Hangar No. 1. The design on the shirt shows the seal of Lowry AFB and the roundels used on USAF aircraft from the time the base opened until it closed. This entry was posted in Ewan Tallentire art, Historyonashirt, WWI and tagged Air Force Academy, glenn miller, Lowry, Lowry AFB, wwi pilots. Bookmark the permalink.